WOW that’s a great looking knife. Too bad I’ll probably never see one in person. Thanks for taking the time to share a review and video, Dan! It’s the only way most of us will get to appreciate it. On a practical note, is there a reason for composite blades besides aesthetics? Not that there needs to be another reason… I’m just wondering. My pleasure, Ameer. I figure if there was a time to make a video comeback, this was it. There is no practical reason for the composite blade. Just pure eye candy. Wow Dan, that is a beauty. Love that blade. You get to keep it too. I too was a lotto winner for the ZT 0454 at the show. But I sold mine on Ebay last month. I bought it at $500.00 and sold it at $1,100.00. The serial # on mine was 042. Thanks for dropping by. I ended up selling mine too for a healthy sum. Its an awesome knife and I would love to still have it in my collection… but I couldn’t turn down what I was offered. 1. Not to be “nitpicky” (and I know you know the difference), but the steel in the outer “layers” are CPM D2. 2. Why aren’t the reviews dated? It would be nice to know when they were written. 2. That’s a good question. I have been running this site for several years and its kind of cobbled together. At some point I did something that inadvertently knocked out the dates on the reviews, and I have tried to fix it but haven’t been able to. I find the detente on the knife excessive. To reliably open the knife you can’t have any pressure on the lockbar. It makes the knife quite awkward to open. Personally, I think it’s a design flaw from that point of view, though the knife is very nice in all other ways. Overall, the 0777 was a better knife. Thanks for stopping by, Gary. I happened to like the heavy detent, but see your point. 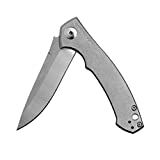 Since I’m probably not going to get one of these anywhere near a reasonable price, what do you think about the zt452cf as a replacement? I feel like the only thing that I would lose besides the composite blade would be the prestige. And how would you compare it to the Fantoni CUT Flipper? I haven’t handled a 452CF yet, but it looks sweet and priced very attractively. The original 454 has a full 3-D machined CF handle with a sub frame lock, while the 452CF is a titanium frame lock with a CF handle slab, but I think you will get most of the magic of the 454. That said, I won’t know for sure until I check one out. I’ll get one eventually. The CUT Flipper is sweet in it’s own right. The biggest problem is the flipping action on it is unfortunately not that good.